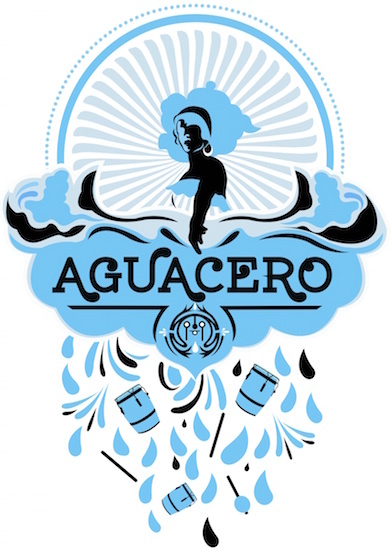 Aguacero is an artistic, educational, and cultural project that focuses on the traditions and creative expressions of Puerto Rican Bomba music and dance. Aguacero literally means a sudden heavy rainstorm usually followed by a refreshing sky clearing and gust of sunshine. The spirit and practice of Bomba, like an aguacero, is intense, healing and promotes life and growth. Through song, music and dance, Aguacero embodies the life, energy, and continuity of water in nature. As an education project, Aguacero includes the Bomba y Plena Adult and Youth Workshops and the music and dance youth ensemble Quenepas. These groups were born and blossomed under the artistic direction of Aguacero’s founder, Shefali Shah, and the music direction of Hector Lugo. As a performance ensemble, Aguacero came together in 2006 as a collective of skilled Bay Area dancers, musicians, poets and songwriters practicing, studying, and performing Bomba and other Puerto Rican and Caribbean folkloric traditions. Aguacero carries out its vision to create and share new original works in Bomba and to affirm perspectives and expressions of the genre rooted in the teachings of our masters and ancestors. Aguacero was featured in the 2008 West Wave Dance Festival at the Yerba Buena Center for the Arts in San Francisco. The collective has performed in numerous festivals and Universities all over California including the San Jose, Oakland, and Alameda County Puerto Rican Day Festivals, and at UC Berkeley and Humboldt State University. Aguacero has collaborated and performed with Los Pleneros de la 21 from New York City and members of La Familia Cepeda, as well as other renowned masters and practitioners from Puerto Rico. Shefali Shah is the founder and artistic director of Aguacero. Hector Lugo is the collective’s musical director and mentor. Aguacero is available for performances, lecture demonstrations, and educational workshops.